Every handyman and do-it-yourselfer is sure to love this ultra-durable, compact and convenient multi-tool. Small enough to carry by itself and sturdy enough for tough jobs, this stainless steel multi-tool boasts a claw hammer, pliers, knife, screwdriver, and much more. It's all the tools you'd keep in a tool box in one simple place. 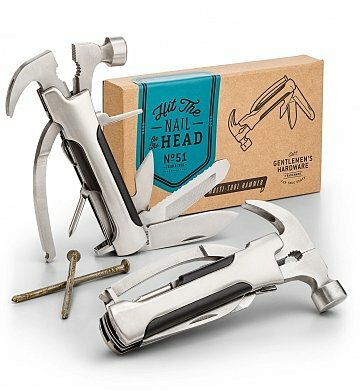 Stainless Steel Multi-Tool Hammer by Gentleman's Hardware. Your gift is securely wrapped to safeguard the shipping process, and arrives presentation-ready with gift ribbon. A complimentary card with your personal message is included with your gift. Measures 4" x 3.5" x 1.5". Stainless Steel Multi-Tool Hammer is a hand delivered gift. These gifts are delivered by one of our local design centers located throughout the United States and Canada. Same day delivery is available for most gifts when ordered before the cutoff time. The cutoff time for Stainless Steel Multi-Tool Hammer is in the recipient's time zone.